The '65 GT350 Mustang was equipped at Shelby American with a mechanical oil pressure. 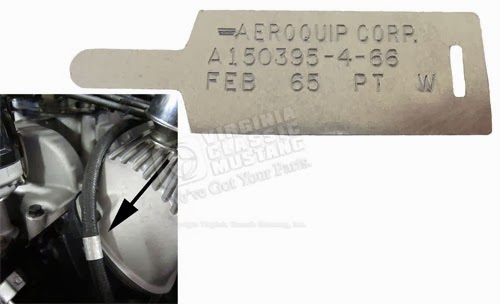 An Aeroquip oil pressure hose was used from the gauge to the engine block. This hose was originally "marked" with an aluminum tag with a date. We now have these tags with February, March and April dates. They have the original markings and are designed to wrap around the line exactly like the originals.